Boxers as a breed are a gentle, loving, family companion. They are good with children and very clean dogs. This Christmas ornament has a boxer dog wearing a Santa hat, and has dangling legs. 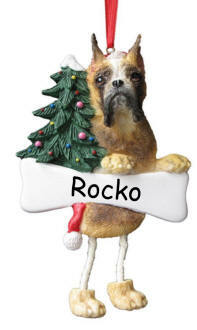 We will personalize this boxer ornament with your pet's name and the year if desired.